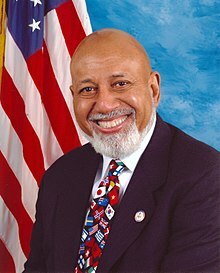 Alcee Lamar Hastings (born September 5, 1936) is the U.S. Representative for Florida's 20th congressional district. The district includes most of the majority-black precincts in and around Fort Lauderdale and West Palm Beach. A Democrat, Hastings served as a United States District Judge of the United States District Court for the Southern District of Florida until his impeachment and removal. Following Senator Bill Nelson's departure from office in January 2019, Hastings became the dean (or longest-serving member) of Florida's congressional delegation. He has been recently diagnosed with pancreatic cancer. Born in Altamonte Springs, Florida, Hastings was educated at Howard University in Washington, D.C. and Fisk University in Nashville, Tennessee. He earned his Bachelor of Arts degree in zoology and botany from Fisk in 1958. He attended Howard University School of Law from 1958 to 1960, and received his Juris Doctor from Florida A&M University College of Law in 1963. While in school, he became a member of the Kappa Alpha Psi fraternity. He was admitted to the bar in 1963, and began to practice law. Hastings decided to run for the United States Senate in 1970 after incumbent Spessard Holland decided to retire. He failed to win the Democratic primary or make the runoff election, finishing fourth out of five candidates, with 13% of the vote. Governor Farris Bryant finished first with 33% of the vote. Lawton Chiles was second with 26%. Chiles defeated Bryant in the runoff election and won the November general election. In 1977, Hastings became a judge of the circuit court of Broward County, Florida. On August 28, 1979, President Jimmy Carter nominated Hastings to the United States District Court for the Southern District of Florida, to a new seat authorized by 92 Stat. 1629. He was confirmed by the United States Senate on October 31, 1979, and received his commission on November 2, 1979. His service was terminated on October 20, 1989, due to impeachment and conviction. In 1988, the Democratic-controlled United States House of Representatives took up the case, and Hastings was impeached for bribery and perjury by a vote of 413–3. He was then convicted on October 20, 1989, by the United States Senate, becoming the sixth federal judge in the history of the United States to be removed from office by the Senate. The Senate, in two hours of roll calls, voted on 11 of the 17 articles of impeachment. It convicted Hastings of eight of the 11 articles. The vote on the first article was 69 for and 26 opposed. Alleged co-conspirator attorney William Borders went to jail again for refusing to testify in the impeachment proceedings, but was later given a full pardon by President Bill Clinton on his last day in office. Hastings filed suit in federal court claiming that his impeachment trial was invalid because he was tried by a Senate committee, not in front of the full Senate, and that he had been acquitted in a criminal trial. Judge Stanley Sporkin ruled in favor of Hastings, remanding the case to the Senate, but stayed his ruling pending the outcome of an appeal to the Supreme Court in a similar case regarding Judge Walter Nixon, who had also been impeached and removed. Sporkin found some "crucial distinctions" between Nixon's case and Hastings's – specifically, that Nixon had been convicted criminally, and that Hastings was not found guilty by two-thirds of the committee who actually "tried" his impeachment in the Senate. He added that Hastings had a right to trial by the full Senate. Hastings attempted to make a political comeback by running for Secretary of State of Florida, campaigning on a platform of legalizing casinos. In a three-way Democratic primary, he placed second with 33% of the vote, behind newspaper columnist Jim Minter's 38% of the vote. In the runoff, which saw a large dropoff in turnout, Minter defeated Hastings, 67%–33%. Hastings won just one of Florida's 67 counties: Miami-Dade. Hastings was elected to the United States House of Representatives in 1992, representing Florida's 23rd district. After placing second in the initial Democratic primary for the post, he scored an upset victory over state representative Lois J. Frankel in the runoff and went on to easily win election in the heavily Democratic district. He has not faced a serious challenge for reelection since. After redistricting, Hastings has represented Florida's 20th district since January 2013. Hastings is a member of the Congressional Black Caucus and was elected president of the Parliamentary Assembly of the Organization for Security and Co-operation in Europe in July 2004. Today, as a senior Democratic whip, Hastings is an influential member of the Democratic leadership. He is also a member of the House Rules Committee and a senior member of the House Permanent Select Committee on Intelligence (HPSCI). On the HPSCI, Hastings is the chairman of the Subcommittee on Oversight and Investigations. Hastings was one of 31 House members who voted not to count the electoral votes from Ohio in the 2004 presidential election. Hastings voted to impeach Texas federal judge Samuel B. Kent on all four counts presented against him on June 19, 2009. On September 24, 2008, Hastings came under fire for comments he made about Republican vice-presidential candidate Sarah Palin. Speaking in Washington D.C. to a conference sponsored by the National Jewish Democratic Council, he said, "If Sarah Palin isn't enough of a reason for you to get over whatever your problem is with Barack Obama, then you damn well had better pay attention. Anybody toting guns and stripping moose don't care too much about what they do with Jews and blacks. So, you just think this through." On September 29, 2008, Hastings issued a written apology, while standing by its core message: "I regret the comments I made last Tuesday that were not smart and certainly not relevant to hunters or sportsmen. The point I made, and will continue to make, is that the policies and priorities of a McCain-Palin administration would be anathema to most African Americans and Jews. I regret that I was not clearer and apologize to Governor Palin, my host where I was speaking, and those who my comments may have offended." In May 2009, the Wall Street Journal reported that Hastings spent over $24,000 in taxpayer money in 2008 to lease a luxury Lexus hybrid sedan. The Journal noted that the expenditure was legal, properly accounted for, and drawn from an expense allowance the U.S. government grants to all lawmakers. In March 2010, Hastings defended Democrats’ approach to passing the Patient Protection and Affordable Care Act, saying "I wish that I had been there when Thomas Edison made the remark that I think applies here: 'There ain't no rules around here, we're trying to accomplish something.' And therefore, when the deal goes down, all this talk about rules, we make them up as we go along." In June 2011, one of Hastings's staff members, Winsome Packer, filed a lawsuit alleging that he had made repeated unwanted sexual advances and threatened her job when she refused him. A congressional ethics panel investigated these claims. Packer was represented by the conservative legal group Judicial Watch. Hastings denied the allegations and called them "ludicrous." He said, "I will win this lawsuit. That is a certainty. In a race with a lie, the truth always wins. And when the truth comes to light and the personal agendas of my accusers are exposed, I will be vindicated.” In February 2012, it was reported that Hastings would be released from the lawsuit, and it would only continue against the Helsinki Commission which Hastings chaired and Packer represented in Vienna. In December 2017, it was reported that the Treasury Department paid $220,000 to settle the lawsuit. Hastings later complained that he played no role in the settlement negotiations but the way they had been framed implied that he had. In a 2011 survey of U.S. lawmakers, the Center for Responsive Politics named Hastings the "Poorest Member of Congress," with a 2010 average net worth of −$4,732,002. His congressional financial disclosure form indicated that, as of 2010, Hastings did not have any earned income, had a bank account with a balance in the $1,000 to $15,000 range, and owed several million dollars in legal fees to several attorneys stemming from the 1981–1989 charges. In 2012, Hastings was ranked #1 out of the 435 members of the U.S. House of Representatives for paying salaries and fees to family members, according to the conservative watchdog group Judicial Watch. A state-by-state report on members of Congress published by the Citizens for Responsibility and Ethics in Washington reported that Hastings paid his girlfriend, Patricia Williams, an attorney who worked as his deputy district director, $622,574 over the four-year period, from 2007 to 2010. Hastings won the general election on November 8, 2016, defeating Republican Gary Stein 80% to 20%. Hastings has said that gun control is a "critical element" in addressing the United States' crime problem. He favors reinstating the Federal Assault Weapons Ban and supports a federal ban on bump stocks. He supports raising the minimum age to buy a rifle from 18 to 21. In 2017, he voted against the Concealed Carry Reciprocity Act of 2017. His current rating from the NRA is an F, indicating that it believes he does not support gun rights legislation. Following the 2018 Stoneman Douglas High School shooting, Hastings released a statement in which he said, "The stranglehold of the gun lobby has gone on long enough." Hastings wrote a letter to the Speaker of the Florida House and President of the Florida Senate urging them to repeal the state's preemption law, which prohibits communities in Florida from passing their own gun regulations. ^ a b Senate Removes Hastings, The Washington Post, October 21, 1989. Retrieved March 14, 2012. ^ "Rep. Alcee Hastings diagnosed with pancreatic cancer". The Washington Post. January 14, 2019. Retrieved January 14, 2019. ^ a b c d Congressional Directory 2005–2006: One Hundred Ninth Congress, p. 68. ^ "Our Campaigns – FL US Senate – D Primary Race". www.ourcampaigns.com. September 8, 1970. ^ "The Power of the Pardon". Law.com. 2011-07-15. Archived from the original on February 16, 2009. Retrieved 2011-07-22. ^ "Senate Conviction of Hastings Is Reversed by Judge Sporkin". The Washington Post. 1992-09-18. Retrieved 2011-07-22. ^ "Our Campaigns – FL Secretary of State – D Runoff Race". www.ourcampaigns.com. October 2, 1990. ^ "109 1st U.S. House of Representatives MOTION On Agreeing to the Objection". 2005-01-12. Retrieved 2018-03-27. ^ "U.S. House of Representatives Roll Call Votes". Clerk.house.gov. Retrieved 2010-08-23. ^ Anderson, Rigel (2008-09-24). "Florida Congressman: Palin 'Don't Care Too Much What They Do With Jews and Blacks' – Political Radar". Blogs.abcnews.com. Retrieved 2010-08-23. ^ "Black Florida congressman apologizes for Palin comments". CNN. 2008-09-29. Archived from the original on 24 March 2010. Retrieved April 23, 2010. ^ Radnofsky, Louise; Farnam, T.W. (May 30, 2009). "Lawmakers Bill Taxpayers For TVs, Cameras, Lexus". Wall Street Journal. Archived from the original on 8 June 2009. Retrieved 2009-06-15. ^ "Rep. Alcee Hastings invokes Thomas Edison: 'No rules around here – we're trying to accomplish something'". Post on Politics. 2010-03-20. Retrieved 2010-08-23. ^ a b Fields, Gary; Mullins, Brody (2011-06-22). "Florida Congressman Faces New Ethics Review". Online.wsj.com. Retrieved 2011-07-22. ^ McCormack, Simon (2011-06-22). "Alcee Hastings Sexual Harassment Allegation Investigated By Ethics Panel". Huffingtonpost.com. Retrieved 2011-07-22. ^ "Winsome Packer Claims Alcee Hastings Harassment in Lawsuit". news.lalate.com. ^ "Alcee Hastings Released From Personal Liability In Sexual Harassment Lawsuit". The Huffington Post. 14 February 2012. Archived from the original on 16 February 2012. Retrieved 6 July 2012. ^ Akin, Stephanie (2017-12-09). "Exclusive: Taxpayers Paid $220K to Settle Case Involving Rep. Alcee Hastings". Roll Call. Retrieved 2017-12-09. ^ "Richest and 'poorest' Members of Congress". Washingtonpost.com. 2011-12-30. Retrieved 2011-12-30. ^ "Calendar Year 2010 Financial Disclosure Statement, The Hon. Alcee Lamar Hastings" (PDF). ^ "Alcee Hastings Ranks No. 1 in Nepotism". Judicial Watch. 27 March 2012. ^ "Florida's 20th Congressional District election, 2016". Ballotpedia. Retrieved 2018-03-27. ^ "Gun Control". U.S. Congressman Alcee L. Hastings. U.S. Federal Government. Retrieved 6 March 2018. ^ Daugherty, Alex (20 February 2018). "Where South Floridians in Congress stand on gun legislatio". Miami Herald. Miami, Florida. Retrieved 6 March 2018. ^ "Statement on Marjory Stoneman Douglas High School Shooting". U.S. Congressman Alcee L. Hastings. 14 February 2018. Retrieved 6 March 2018. ^ "Hastings Urges Florida State Legislature to Repeal Firearm Preemption Law". U.S. Congressman Alcee L. Hastings. U. S. Federal Government. 27 February 2018. Retrieved 6 March 2018. U.S. House of Representatives (2005). Congressional Directory 2005–2006: One Hundred Ninth Congress. Washington, DC: U.S. Government Printing Office. ISBN 978-0-16-072467-1.